The time: December, 1947. The place: Bell Telephone Laboratories at Murray Hill, N.J. The event: the invention of a new kind of electronic “valve” that can amplify signalsâ€”an invention so basic that it will virtually remold all science and technology. Unlike the vacuum tube, it will not need a power-consuming hot filament, nor will it require a vacuum. Is it an impractical dream? Many skeptics think so. After years of experimenting, Bell scientists, faced with repeated failures, have turned back to basic research. “If we’d understood the physics, we would have known why those early transistors didn’t work,” says Dr. William Shockley, co-creator, with John Bardeen and Walter Brattain, of the first transistors. The beginning. Shockley first attempted to build a practical device in 1938, meeting with no success. After the war, enthusiastic over Bell’s progress in developing silicon-crystal diodes for radar and microwave systems, he returned to the problem. Working with silicon and germanium (the two semiconducting materials used in all transistors) and insulators, he tried and failed again. Brattain and Bardeen, studying other aspects of the problem, believed they might have a solution. Brattain first tried placing a metal point contact on the surface of an N-type germanium slice he’d immersed in an electrolyte. He got amplification, but only at very low frequencies. Then, as a result of a fortunate accident, they discovered that the electrolyte, and an oxide layer they’d tried in place of it, could be disposed of; a direct connection between a gold contact and the piece of germanium could produce a slight amplifying effect. Bardeen and Brattain talked over what had happened with other members of the research team. By day’s end, they had figured out how to make a working transistor and immediately produced one. The scientists huddled with R. B. Gibney, a physical chemist, trying to figure out what went wrong. Then, as suddenly as it had vanished, the transistor effect returned. Unable to quite believe what was happening, the scientists made measurement after measurement. The answer came out the same. Two tiny wires in contact with the surface of a slab of germanium were actually amplifying a signal. “See if you can make it oscillate,” suggested Harvey Fletcher, Bell Labs physical-research director. Fletcher reasoned that if the device was really amplifying (taking DC battery power and adding it to the varying AC power of an incoming signal), it should be possible to connect its input and output together with suitable circuitry and make it generate a steady AC signal. In an hour or two, the transistor had passed the test. And on Dec. 23, 1947, the trio of Bardeen, Brattain, and Shockley demonstrated that a small piece of germanium could be made to amplify a speech signal about 40 times. The momentous discovery was to be a closely held secret until June, 1948â€”20 years ago this monthâ€”so that the researchers could test and retest and explore the significance of what they had accomplished. The “impossible” happened again. By 1951, Bell Labs was successfully building junction transistors. And by 1954, they were being mass-produced. The transistor revolution. From the transistor radio to the computer to the Apollo spacecraft, transistors are to electronics what nuts and bolts are to hardware. They’re used in cars, boats, power toolsâ€”everywhere from ocean bottom to outer space. In 1954, 1.3 million transistors worth 5.1 million dollars were sold. By 1966, these figures had climbed to 849.9 million, worth 441.8 million dollars. Equally impressive is the enormous reduction in the cost of the transistor. In 1954, the relatively new devices had an average value of $3.89 each. 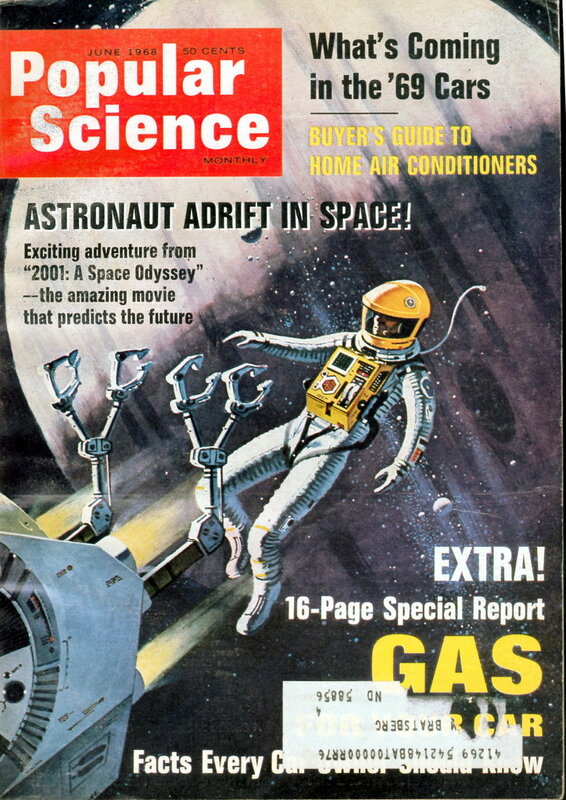 By 1966, the figure was down to 52 cents. Integrated circuits, direct descendants of transistor technology, are now stealing the show. In 1965, some 9.5 million units worth 79 million dollars were sold; by 1966 sales of ICs trebled to 29.4 million, worth 148 million dollars. Rather than an end in itself, the invention of the transistor was the opening of a door that has led, and is leading, to a whole series of spectacular developments. Impurities that conduct. The basic idea is simple. Take crystals of germanium or silicon, elements which do not normally conduct electricity. Add tiny amounts of impurities to alter crystal structure. One type of impurity gives the material an excess of conduction electrons (N type), while another creates a lack of electrons (P type). It is these impurities that give transistors the ability to conduct an electric current and to regulate its flow. 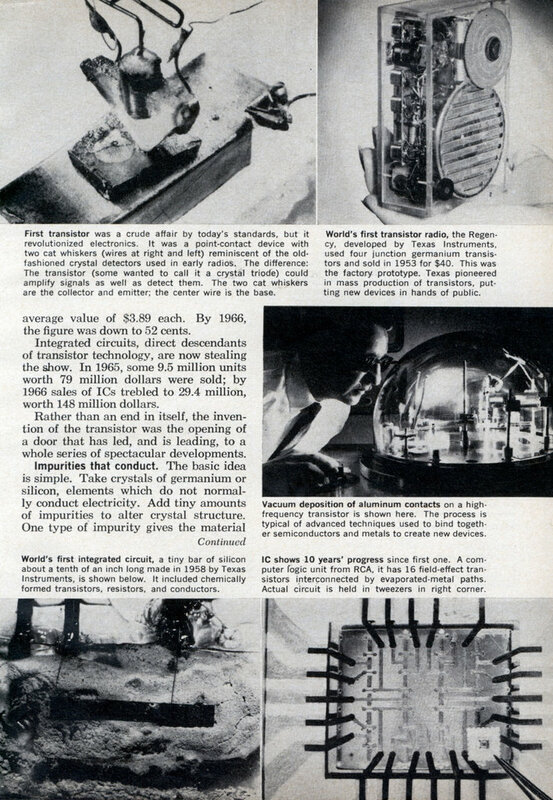 â€¢ In 1954, zone refining made it possible to control impurities in germanium. Now both grown-junction transistors and high-purity materials could be easily and economically produced. â€¢ The year 1955 brought two brand-new techniques. One was to simply grow crystals with controlled amounts of impurities. Slice them apart and you have a handful of transistors. Alloy-junction transistors were the second breakthrough. Dots of impurities are placed on either side of a wafer and simply heated until they penetrate. â€¢ In 1955, too, came the diffusion process. Impurities are diffused into a wafer by heating the material in an atmosphere containing the impurities in gaseous form. â€¢ In 1959, the flat, rugged planar transistor was developed. â€¢ In 1962, the epitaxial technique of growing a very thin layer of N-type material on a wafer of P-type material helped clear the way for integrated circuits. Through the opened door. Now it was possible, starting with a chip of silicon having layers of P and N material, to form tiny circuits complete with microscopic transistors, diodes, resistors, and capacitors. Today, ICs are beginning to supplant transistors as the major factor in semiconductor electronics. Will there be other truly “basic” inventions like the transistor, ones that will reshape the world we live in? Even today, Dr. Shockley is working on a new method of storing information using the basic molecular structure of new magnetic materials. If he succeeds, “thinking” robots will be practical. “One of the things I imagine,” he said recently, “are machines with compact memories you’d train to do jobs in your home. Ultimately, you could develop a machine to teach other machines.